For my last post in the "not just waffles and chocolate" series of Belgium train posts, I'm going to post some passenger train photos, in the order I took them. Here's a train at sunrise on the 13th. I'm fascinated by the electric overhead lines. Have a look at the little details as we go through these photos. Power wires, support wires, support poles, tensioners, weights... lots of little things. A Desiro ML trainset at sunset in Aalter. With a busy line like the Antwerp-Brussels line, you have to have signals to control traffic. Signals like this are everywhere. 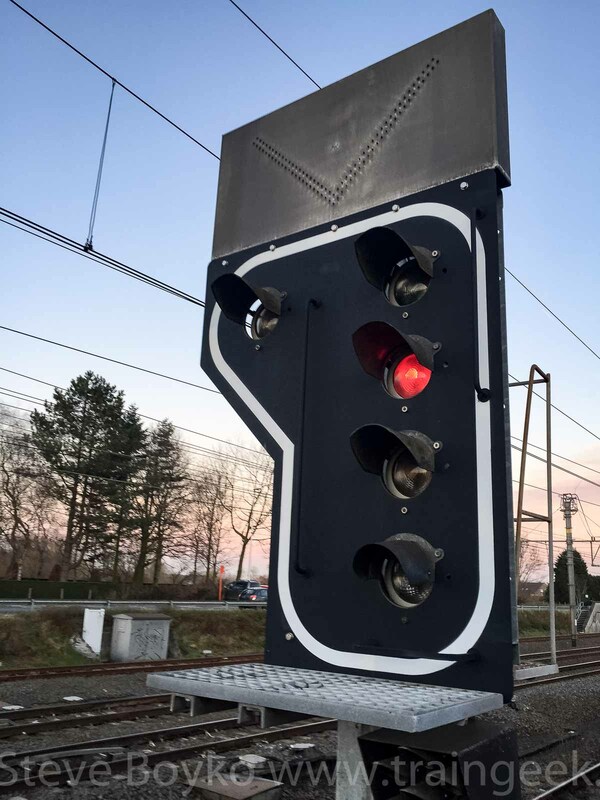 I can't claim to understand Belgian signals after observing them for two weeks, but I can tell you that red means "no train coming" and green means "train imminent". 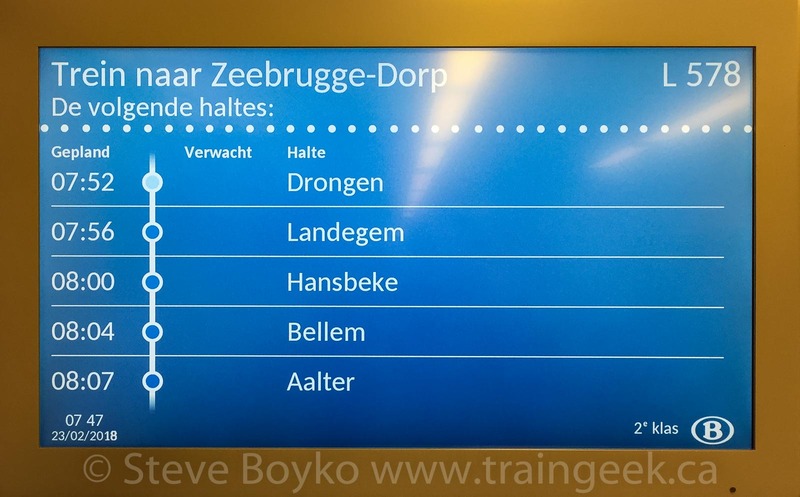 This page has a ridiculous amount of detail on Belgian train signals. 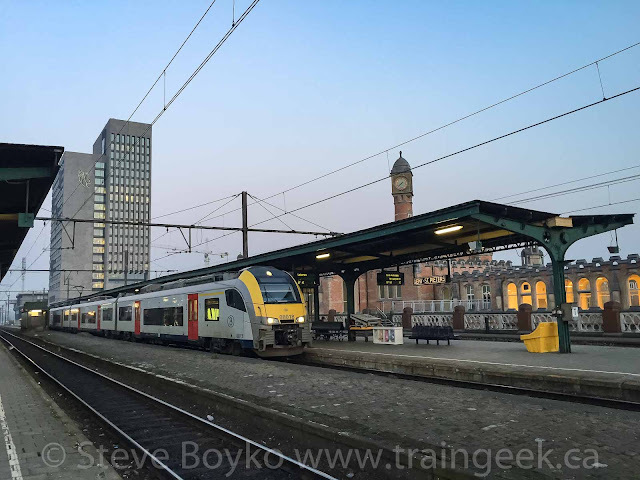 Note that in Belgium, trains normally go on the left track when there are two tracks. It was getting pretty dark but I managed to capture a Desiro ML train zooming into Aalter. There's a road bridge over the tracks down from the station, and I stood to the side to capture the train. I would have liked to have been right over the train, but there are walls on either side of the overpass preventing any view of the tracks. I imagine that's to prevent any debris - intentional or otherwise - from falling onto the tracks, but it also prevents photography! "Vijf Vakken" translates to "five boxes" or "five pockets". I think it means there are 5 parking spaces at this location, which I confirmed by using Google Street View. Literally one minute later, the Desiro left and this train was still waiting at another platform. You'll notice there are a lot of tracks here - maybe six - with four of them at platforms. The outer two seem to be used for through trains that don't stop. On board a train on February 17. I think this was a Desiro ML trainset but I'm not sure. 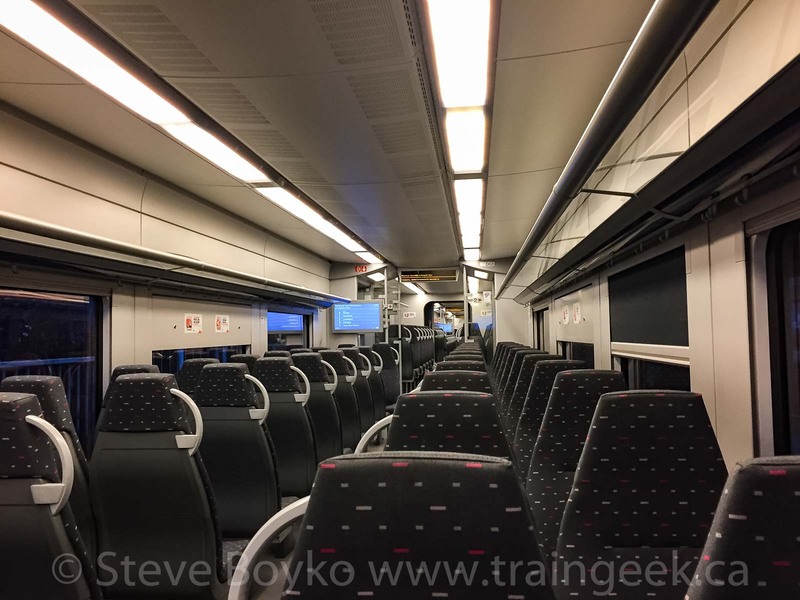 This was early on Saturday as I took the train to Brussels to meet my wife at the airport. 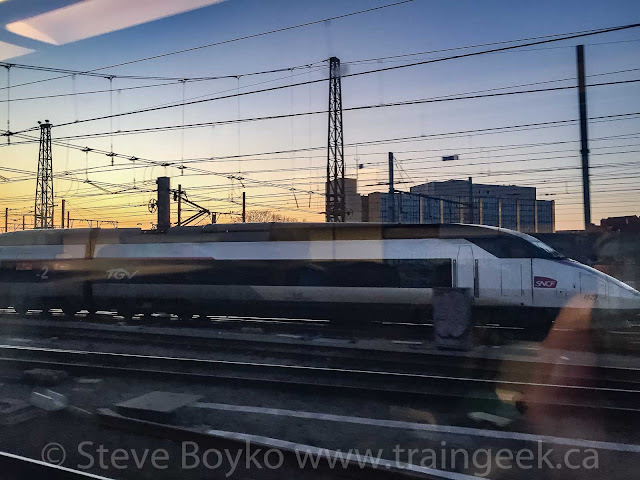 I caught a French TGV train out the window as we rolled past at sunset. This must have been Ghent. 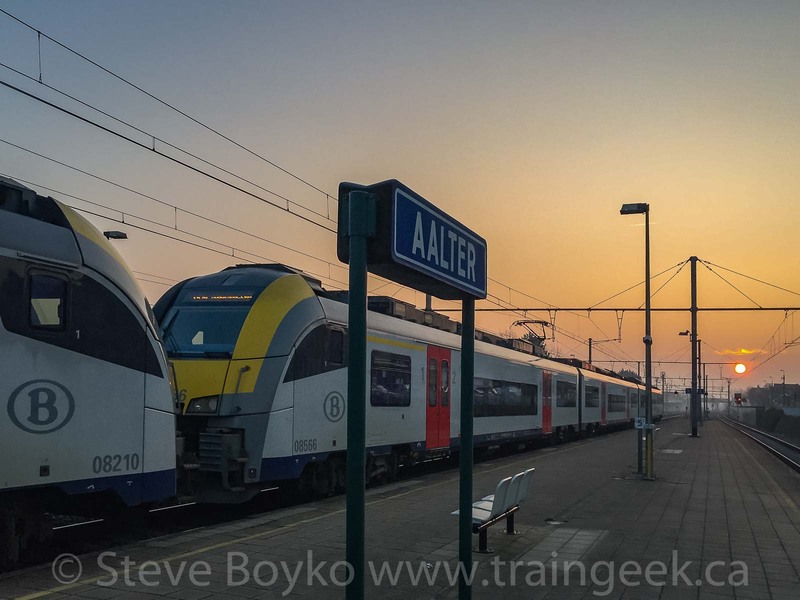 A Desiro ML trainset comes rolling into Aalter as a double-decker train waits on the adjacent track. These are a bit of a mystery to me. 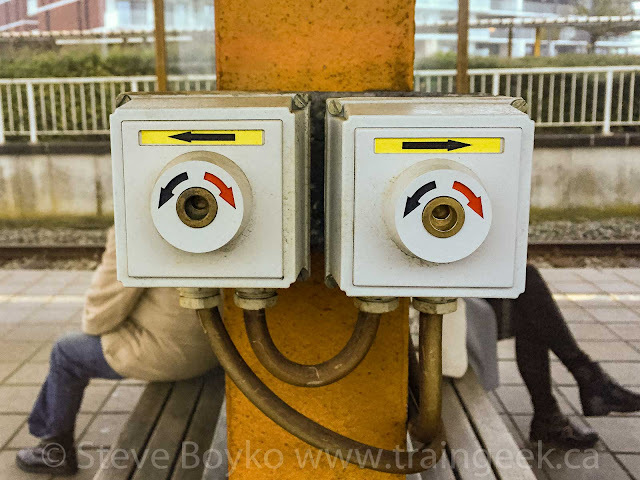 These rotary switches are located on a post or wall on every train platform, as far as I can see. Here's the sequence that I observed whenever a train was readying to depart. All of the onboard train crew blow their whistles. They look up and down the train to confirm nobody is trying to get on or off. All but one person gets on the train. The last person walks over to these switches and turns one. They get onboard, press a button on the train, and the train departs. My guess is that this is a request to depart the station, or a signal to the traffic controller that they are departing. It doesn't change the signal being displayed - it was already green before they turn it. 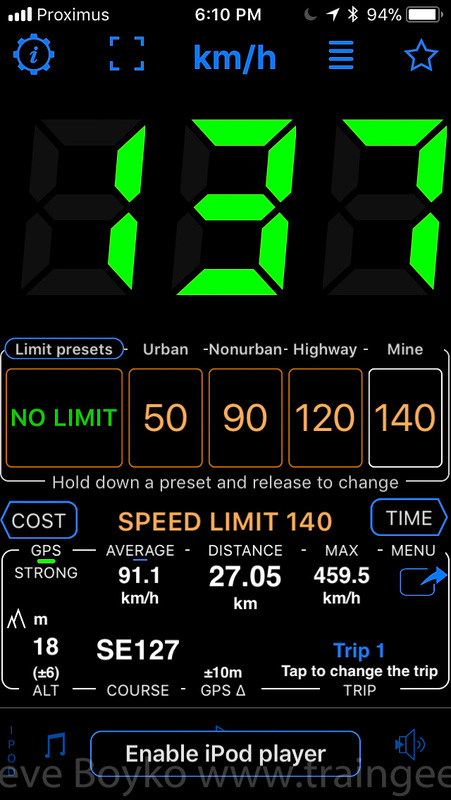 We were rolling along at 137 km/hr when we were heading into Brussels for some night photography. 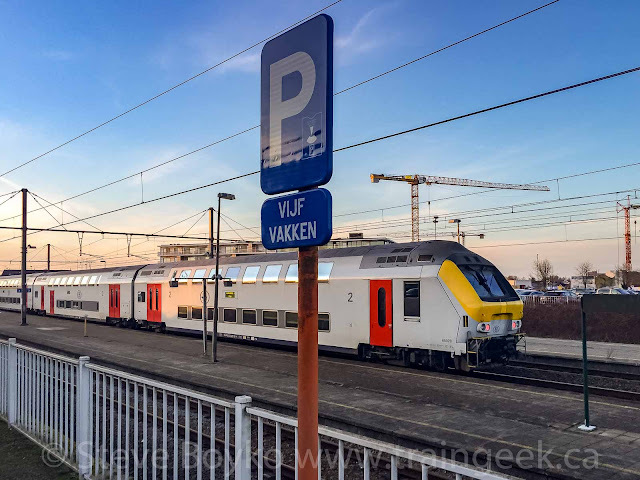 By this time, I was staying in Ghent and commuting to Aalter by train. 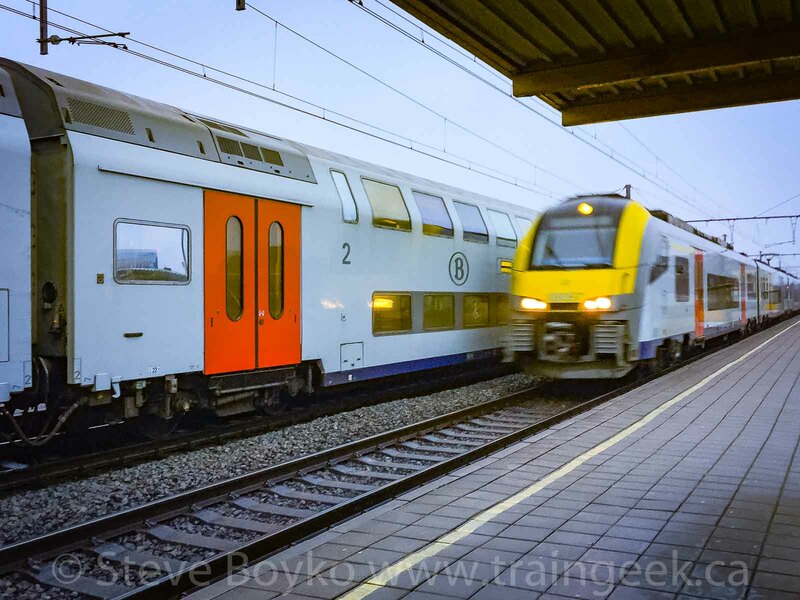 I was waiting for my train when I photographed this Desiro ML trainset. I like that clock tower, part of the Gent-St-Pieters station. February 21 - there's my train! 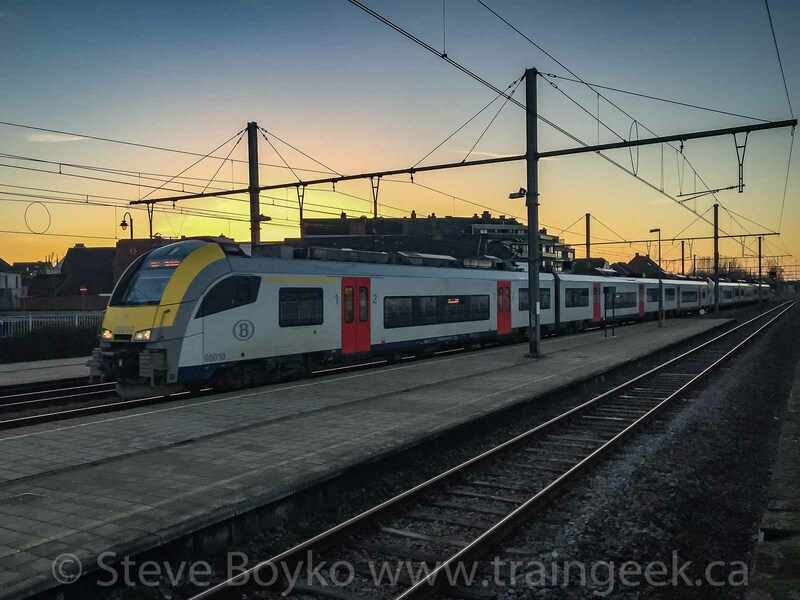 Turning the other way, here's my 07:46 train coming out of the sunrise. I was taking L578 toward Zeebrugge-Dorp. Train L578 starts in Mechelen, north of Belgium. 30 minutes later, I was in Aalter taking this photo. 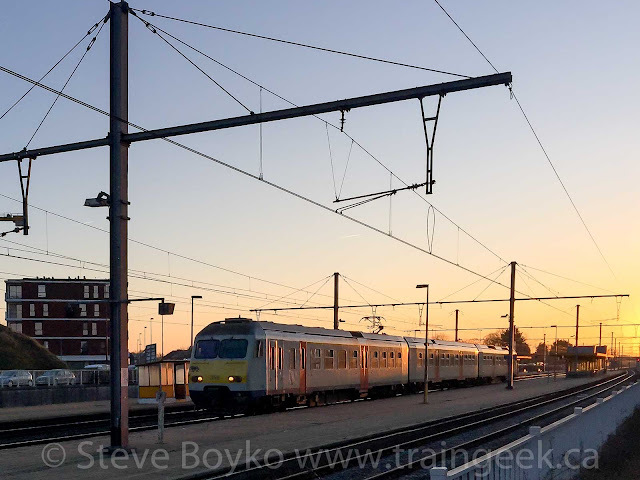 It was a nice morning for train photography, apparently! Here's the onboard display in the Desiro ML train, L578. It was 07:47 so it was just about to depart, ready to roll to Aalter. Note that I was in 2nd class! Some sweet sunset light on the nose of 1867, a EuroSprinter ES60U3. 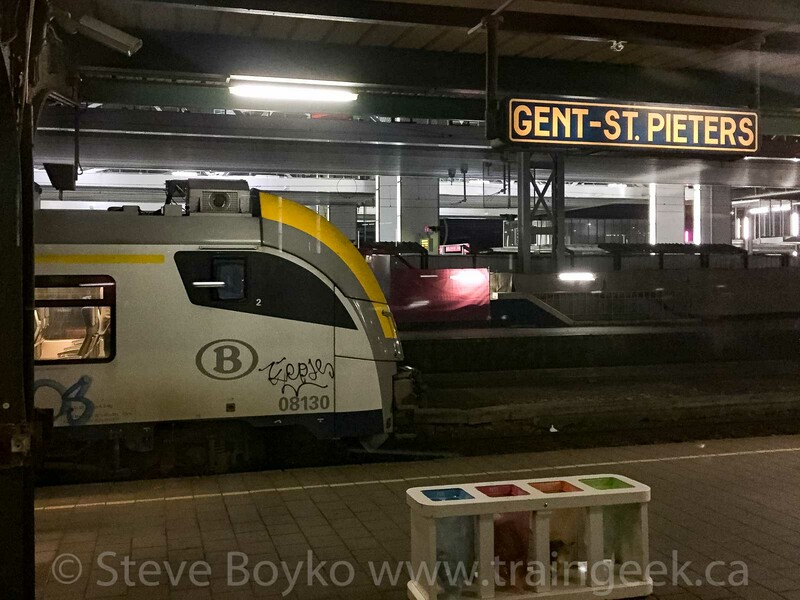 Finally, here's my last train photo in Belgium, our train from Gent-St.-Pieters to the airport. Thanks for reading! 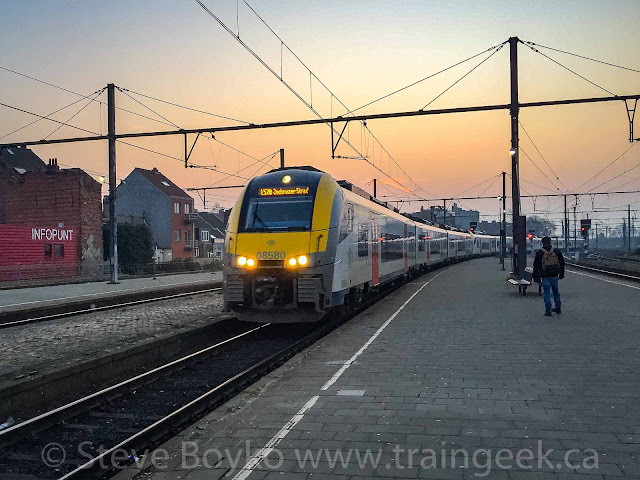 I hope you've enjoyed this series featuring trains in Belgium.